At first our target was to install free flowing well with at least 0.06 liters per second in a 2 meters elevation in order to have 3000 liter ferro-cement Tank. The driller’s tried to install this kind of design for three times but it did not work. At first, the water flows after reaching the acquifer level but when we installed the pipe, it stopped flowing. The team decided to transfer locations and tried up to three times but still failed. In this case, the team agreed to change the driller. New driller is the one who installed all the free flowing wells at the municipality and nearby areas. After the third trials, it was decided to install hand pump in the “bore hole 2” as temporary water source while we are in the process of drilling the final well. 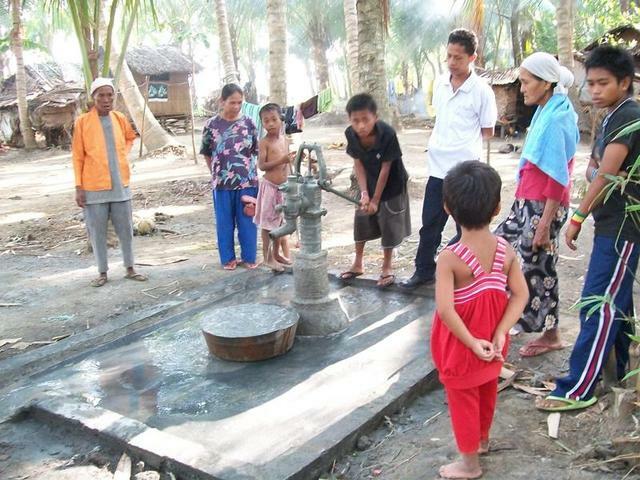 This hand pump was used by many of the people in proper Indatuan for domestic use because the Well 1 is not enough for all purposes. 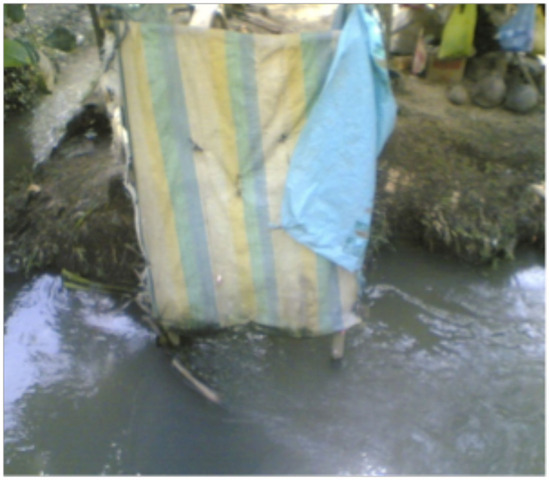 Due to this reason, it was decided not to remove the pump but instead a platform was constructed by the community. At the fourth trial, water flow at 0.5m elevation with the flow rate of 0.07 liters per second. It didn’t reach the elevation of the FC tank top. The WSA suggested changing the design to installation of many free flowing wells. The possibility of this design both technical and budget wise was reviewed by Saidona, Saiden of ASDSW and Norodin of UNYPAD with the supervision of Noraida. The team came to a decision to follow suggestion of the community. Design was 6-unit free flowing wells but if flowing well is not possible in the drilling point, it is agreed to convert immediately to hand pump. This was also in consideration of the efforts of the drillers who might also drill several times if no enough flowing water will be found. As final output, installation of three (3) units free flowing wells and three (3) units hand pumps had been realized. Basically, the new design was made by Norodin Guamaludin of UNYPAD and Reviewed by Saidona Lawan of ASDSW. It is a unique design composed of Artesian Free Flowing well, reservoir, piping and Jetmatic Pump as outlet combined in a system. 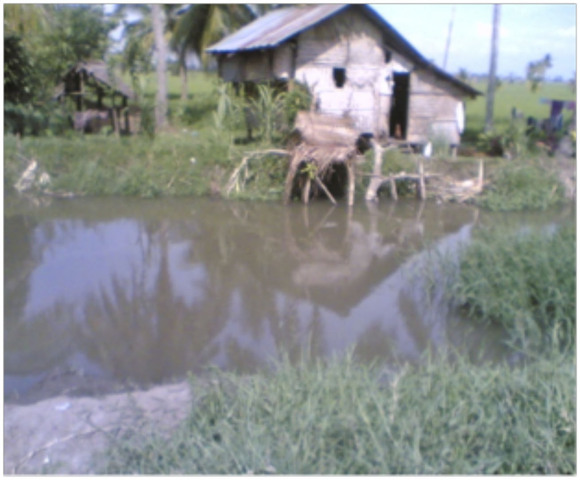 Along with the process of implementation, the nation-wide problem on El Niño significantly affected project implementation. Water table has dropped very low. Faced with the said problem, original design made by engineers from UNYPAD and ASDSW headed by Kevin Lee, was changed after failure to generate desired amount of flowing water. Drilling had been done up to 3 times but still failed. These changes were suggested by the Water Sanitation Association and discussed by the ASDSW together with UNYPAD and subsequently presented to Local Government Unit (LGU)/Municipal WASH Task Force (MWTF). The activity was facilitated by Kevin Lee through ASDSW staff (Saidona Lawan and Saiden Akmad) and UNYPAD staff (Norodin Guiamaludin). This activity was accomplished on January 14, 2010. 3. Presentation of Plan to the MWTF and WSA. UNYPAD conducted the presentation of the final design and work plans to the WSA and the MWTF on January 17, 2010. Details of construction were explained to the group including the required resources. Budget was also presented and the community gave commitment on their counterpart contribution (labor). ASDSW together with UNYPAD canvassed and purchased materials. Saidona Lawan and Norodin Guiamaludin purchased most of the needed materials at FMC Construction Supplies in Midsayap, North Cotabato. This had significantly lowered the cost of transporting materials from supplier to construction site. Initial purchases had been done which included materials needed for the installation of well and construction of FC Tank based on the original design. Also fabricated the 3000 liters Ferro Cement (FCT) Mold needed for FC tank. The materials were exchanged at the next purchase due to the change of design. Instead of buying PE pipe for distribution, it was changed into G.I Pipe for installing more flowing wells or hand pump (in the absence of flowing water). Luckily, the supplier was flexible enough to exchange some of the previously purchased materials with new materials based on the latest design. At first our target was to install a free flowing well with a flowrate of at least 0.06 liters per second in a 2 meters elevation in order to have a 3000 liter ferro-cement Tank. The driller’s tried to install this kind of design three times but it did not work. At first, the water flowed after reaching the acquifer level but when we installed the pipe, it stopped flowing. The team decided to transfer locations and tried up to three times but still failed. In this case, the team agreed to change the driller. The new driller was the one who finally installed all the free flowing wells at the municipality and nearby areas. After the third trials, it was decided to install hand pump in the “bore hole 2” as temporary water source while we were in the process of drilling the final well. This hand pump was used by many of the people in proper Indatuan for domestic use because Well 1 was not enough for all purposes. Due to this reason, it was decided not to remove the pump but instead add a platform that was constructed by the community. At the fourth trial, water flowed at 0.5m elevation with the flow rate of 0.07 liters per second. Unfortunately, it didn’t reach the elevation of the FC tank top. The WSA suggested changing the design to install not just one but many free flowing wells. The possibility of this design both technical and budget wise was reviewed by Saidona, Saiden of ASDSW and Norodin of UNYPAD with the supervision of Noraida Chio, ASDSW Team Leader Cotabato Office. The team approved the suggestions of the community. The design was a 6-units of free flowing wells. If we found that the flowing well was not possible in the drilling point, it is agreed to convert immediately to hand pumps. This was also a consideration in case the drillers had to drill several times again if not enough flowing water could be found. The team reminded the community to continuously pump until the water was clear in order to remove all sand. •	Water was tested at the 3 installed Free Flowing Well (Wells 1, 3 and 5) since the Hand pumps two weeks start up. For now, only the flowing wells are used by the community for all purposes. •	Water test results and analysis showed that said 3 water sources are potable and are safe for drinking. The proposed sign board is made up of framed G.I. 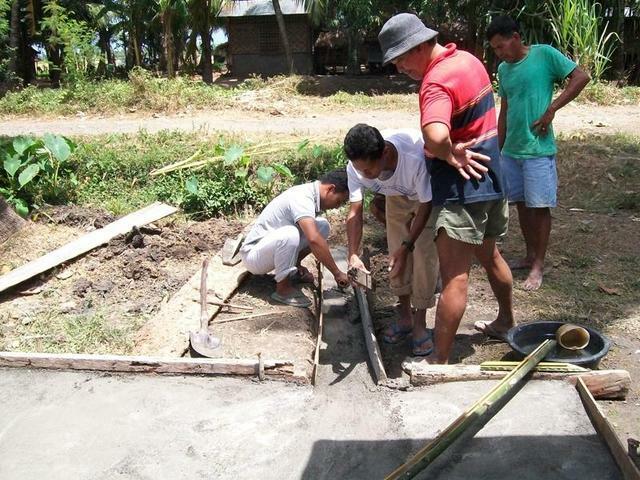 Plain Sheet placed at main entrance of the community in order to easily identify the project by the people entering Indatuan. This is also to ensure that the project will not be used by politicians in campaigning. This is to ensure the community/beneficiaries and/ or WSA will maintain the facilities installed. Issue: Great effect of El Niño problem. The long drought has caused the significant lowering of water table. Resolution: Change of design from level II system with FC tank as reservoir, to Level 1 system with 3 free flowing artesian wells and 3 hand pumps. Resolution: Did courtesy call to the new administration and presented details of the project and planned activities. •	Brgy. Kagawad Sultan Sanday extended his full support and he is one of our companions in the construction of at least four (4) facility platforms. 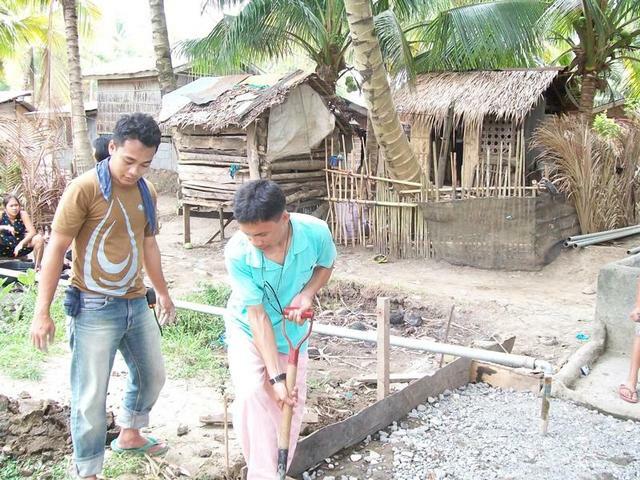 •	Recognition is extended to Nonoy Suraik for voluntarily spearheading the construction of platform of well 5. •	The used of single motor of Saidona contributed a lot in mobilization for daily activities in the field such as supervising the drillers while some members of the team were constructing the platforms. •	Schedule was greatly affected by the problem on drilling due to low water table. Since the activity was analysis and writing, the team decided to do it in the nearby municipality, Midsayap which has more facilities. This was purposedly done because of the absence of an appropriate place within the communty. Multi-purpose center used in the previous activities is prone to disturbance where other people are getting in and out while sessions are on-going. Participants shouldered part of their transportation cost in going to the venue. Initial preparation should be done to ensure smooth flow of construction. This should be done in close partnership with the MWTF, WSA and LGU, reminding them of their local counterparts. WSA members have signified interest in conducting cleaning activity to their area. They have discussed some draft details of the activity and how each of them will share resources as counterpart. It was done on November 30-December 1, 2009. Experiences during WIN was shared by the participants such as: some respondents were ashamed of admitting their sanitation practices, it was only after they interviewed the respondents that realized the problem on sanitation and water, difficulty in reaching other sitios because or distance and absence of road, women are more knowledgeable on the actual WASH situation and practices within their family and community as a whole. Participants were grouped into 3. 1st group incharged of water, 2nd group for sanitation and last group for the hygiene. Each group was asked to categorize the data, analyze then scale up. 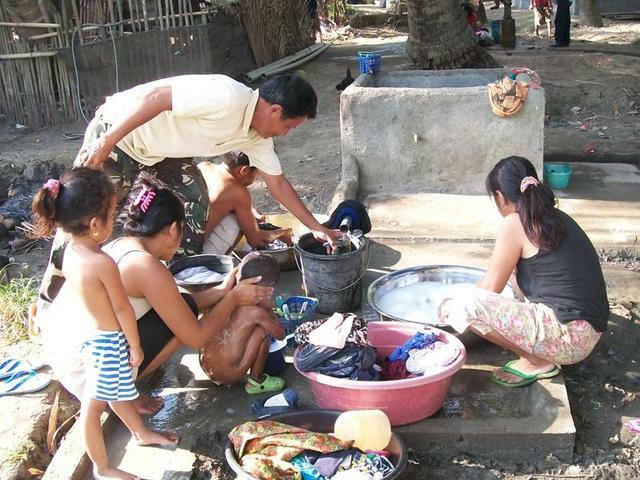 There were ten (10) officers and members of WSA supervised by UNYPAD staff who conducted the WASH Inventory (WIN) in all sitios of the barangay. The team was divided into 2 groups and it took them 3 days to cover 18% or 48 households, out of the 267 total # of households. 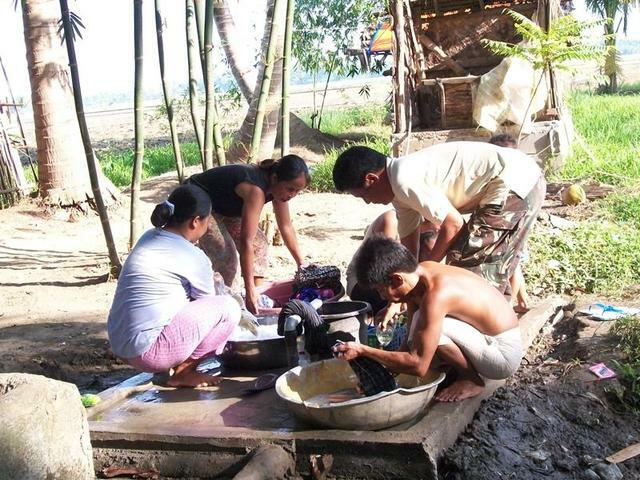 Part of the WIN was water testing on the 11 major sources in the barangay. Officers of WSA who participated in the WIN were properly chosen based on their ability to ask right questions and ability to record/document their findings. There were officers who really wanted to participate but they lack basic skills on reading and writing. Some MWTF officers joined also in the activity. The activity was community-based attended by MWTF and WSA officers on October 27-28, 2009. Most of the presentations were done by staff of UNYPAD coached by the undersigned. Topics discussed included Overview of the Project, WASH situation, Governance Approach on WASH, Roles and Functions of MWTF and WSA, Enhancing Engagement in WASH Project, Method of Gathering Data, Focal Group Dialogue, Community Mapping, Community Calendar, and Venn Diagram. The WIN tool was also explained thoroughly. Cultural Integrity session was discussed by an Ustadz (religious) staff of UNYPAD, Samirudin Bandila, explaining details in Islamic perspective. He mentioned the seven (7) kinds of water allowed by Islam to be used in purification such as rain, dew, snow, spring, sea water, open shallow well and river. This approach of forming WSA is an innovative one compared to the previous practice where BLGU selected who should be in the WSA and normally relatives and allies are being chosen. This time the General Assembly (GA) selects who are qualifed to be in the organization with consideration on their capacity, credibility and track record. This current process is fair and gave everyone the opportunity to lead according to their capacity and commitment. 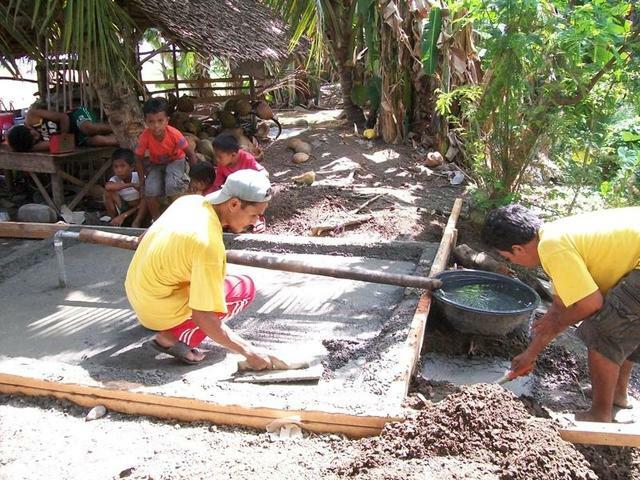 The General Assembly was done in Barangay Indatuan on October 1, 2009. It was participated by 55 leaders representing all sectors in the community. Aside from discussing the roles and functions of WSA, the team decided to include basic information on WASH and why is it important. This is to immediately create demand from the community and for them to look forward in the implementation of the project, taking them as stakeholders. A team from UNYPAD (Anwar Saluwang and Norodin Guiamaludin) and ASDSW (Noraida Chio and Saidona Lawan) paid a courtesy call to the Local Government Unit of Northern Kabuntalan. 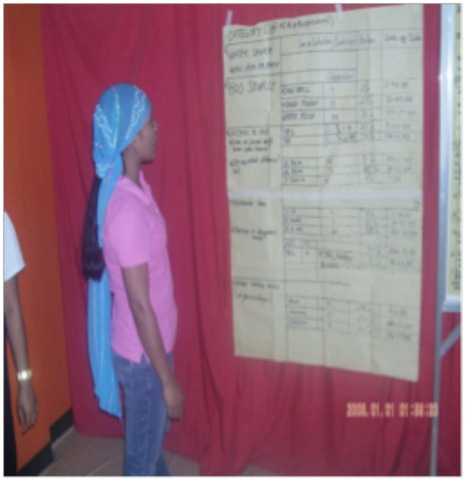 The activity was done on September 15, 2009 at the Municipal Extension Office in Cotabato City. The team was met by the First Lady who is also the First Municipal Councilor in-charged of Health and Sanitation, MPDC Engr. Macarimbang, Municipal Engineer, Municipal Administrator, Municipal Social Worker and Development Officer, Municipal Health Officer and other local leaders. Project details were jointly explained by the team focusing on its objectives , planned activities, resources needed and counterpart of each stakeholder. The need for active participation of the communty members was highlighted. LGU expressed gratitude in selecting their area as project site. They also gave commitment on their counterparts such as hauling of construction materials, storage, security and provision of unskilled labor. One of the results of the meeting was the issuance of the Executive Order (EO) Number 3 series of 2009, giving birth and legal identity to the Municipal WASH Task Force. 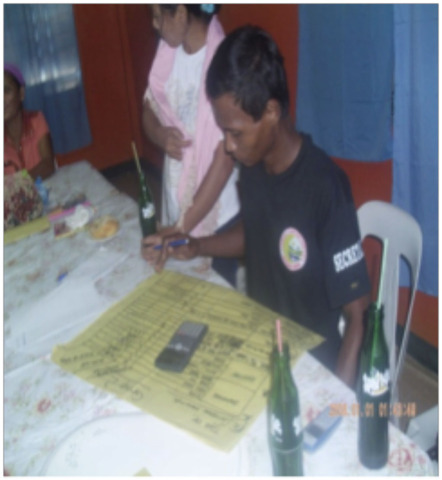 LGU gave assurance on the free conduct of all activities in their community. They also express willingness to provide Police security force should there be a need. Although the grant was received in December, ASDSW had to begin the planning process in September because we knew it was a 6-9 month project planning and implementation process and due to the violent nature of elections in this area, it was crucial that we finish the project before the elections in May 2010. Knowing that we would be receiving the grant, we started the project o try to avoid the inevitable violence. To ensure proper implementation, a meeting on September 13, 2009 was held in the office of UNYPAD attended by their officers such as Mr. Rahib Kudto, National President, Mr. Mahdie Amella, Executive Director, Anwar Saluwang, WASH Project Officer, and from ASDSW: Mr. Kevin Lee, Executive Director, and Noraida S. Chio, Office Team Leader – Cotabato Office. Meeting provided UNYPAD officers complete details about the project and defined the terms of partnership such as roles and functions of all stakeholders, budget, timelines, suggested strategies, and deliverables. Next steps were also agreed upon. This was a capacity building and implementation project that ensures community ownership and creates demand from the start. A Single Drop for Safe Water conducted an holistic training program that created a local PODS (People Offering Deliverable Services) to assess their water and sanitation situation, design a technology and WASH Education strategy, implement a WASH technology solution and create a 3 year community strategic development plan. The first phase of the program was conducting a WASH Orientation, Resource Inventory Mapping workshop. The PODS conducted a survey in the community to identify all the water, sanitation and hygiene practices currently being used in the community as well as mapping all the water and sanitation sources in the community. Collecting this information was key to compiling baseline data that would help them determine measurable outputs. This resulted in the creation of a WASH Situationer Map that was analyzed by the community with ASDSWs coaching. From that situationer map, the PODS created a vision, mission and strategic plan to resolve their community water issues. Barangay Indatuan envisions for a God-fearing and peaceful community where people benefit from an improved social services, livelihood programs, infrastructure and post harvest facilities for sustainable development. 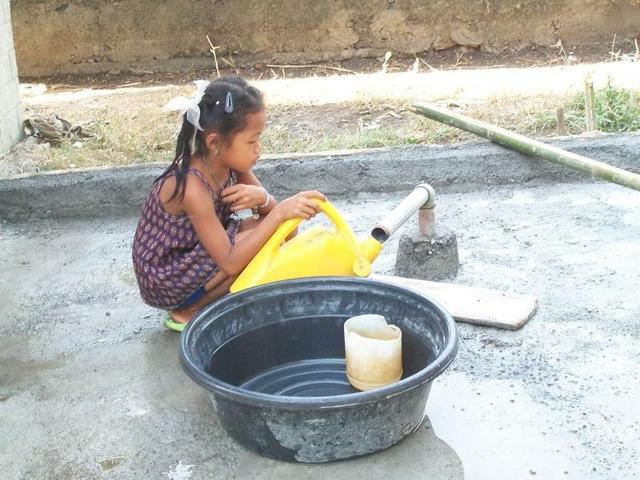 This Barangay WASH Plan supports the Vision of the barangay especially on providing Improved Social Services. Meaningful provision of improved social services includes access to potable water, installation of proper sanitation facilities, and intensified advocacy on WASH which geared towards change of behavior aimed at having clean and safe community. To address the WASH needs through unity among local leaders, meaningful participation of stakeholders and acquiring needed basic technical skills in the provision of improved social services. 6. Intensified advocacy on proper animal herding through the promotion of responsible animal ownership. 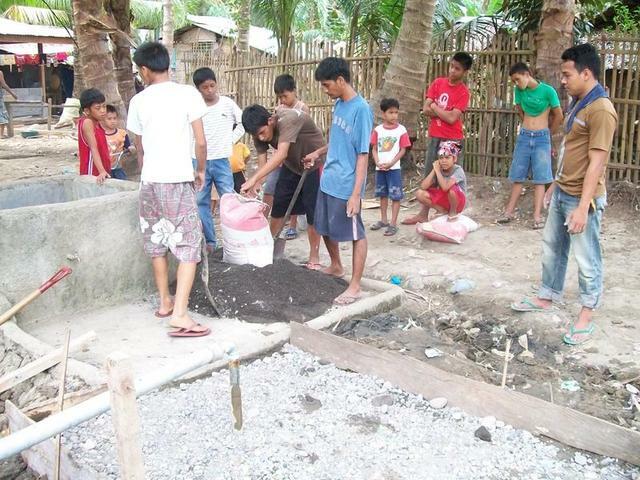 Their first step towards community WASH provision was this project. At first our target is to install free flowing well with at least 0.06 liters per second in a 2 meters elevation in order to have 3000 liter ferro-cement Tank. At the fourth trial, water flow at 0.5m elevation with the flow rate of 0.07 liters per second. It didn’t reach the elevation of the FC tank top. The PODS suggested changing the design to installation of many free flowing wells. The possibility of this design both technical and budget wise was reviewed by Saidona, Saiden of ASDSW and Norodin of UNYPAD with the supervision of Noraida. The implementation process for this project was developed over the previous 18 months as part of a larger multi municipality program. However some key changes were made, particularly in the mobilization of the Water and Sanitation Association or PODS. This resulted in a much more effective implementation process with a very high participation rate in comparison to the previous program. male 68, female 79 all of which participated in trainings and other activites during the project. They all gained new skills and knowledge. There now is a Municipal WASH Task Force for the whole municipality with a Water and Sanitation Associatioin for the Barangay. This project was implemented by the community and coached by ASDSW and UNYPAD. The Municipal Local Government Unit formed a Task Force which now prioritizes Water, Sanitation and Hygiene. 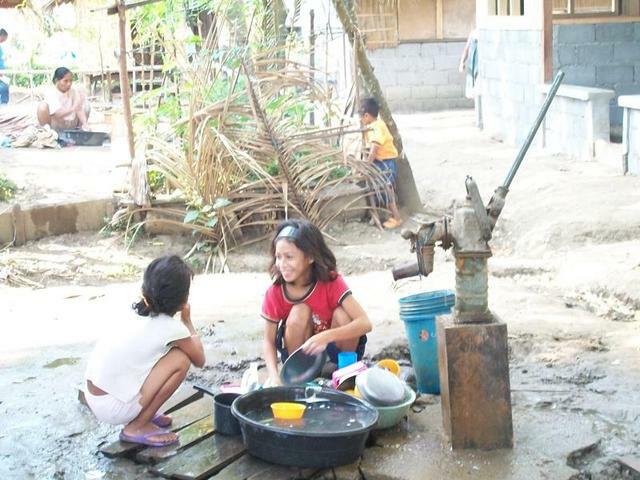 The barangay then formed a Water and Sanitation Association or PODS. These two bodies along with residents of the community implemented the program. As the project was implemented they extended the program to go from an original 5 wells to 7 wells, with the Water and Sanitation Association (PODS) mobiliising resources to purchase more pipes for the additional wells.